Spider-Man: Into the Spider-Verse is a coming of age superhero film for all of those who can finally see themselves wearing the mask. Its message comes through in Miles Morales (Shameik Moore), a black Puerto Rican teenager who has just been enrolled in one of New York City’s most elite middle schools. Miles is like any kid, but he is also so much more. He’s got that sweet, charming swagger that makes him likable, and him being bi-lingual shows how aware the filmmakers are about representation and identity. That identity starts to develop as Miles gets bitten by a radioactive spider, thus giving him the same powers as Spider-Man. While this is a power he didn’t want to have in the first place, he realizes his responsibility to be the new Webslinger when Kingpin (Liev Schreiber) activates a supercollider that not only kills the Peter Parker aka Spider-Man (Chris Pine) of his universe but brings in five other Spider-heroes: a jaded Peter B. Parker (Jake Johnson) of Earth-616, spirited yet vulnerable Spider-Woman (Hailey Steinfeld) of Earth-65, Peni Parker (Kimiko Glenn) and Sp//Dr of the anime-inspired Earth-14512, the colorfully saturated Peter Porker (John Mulaney) of Earth-8311, and the black and white Spider-Man Noir (Nicolas Cage) of Earth-90214. However, if these Spider-heroes stay in Miles’ universe for very long, they risk being disintegrated. So it is up to the inexperienced Miles to help them get back home. And along the way, he learns that there is no right way to be Spider-Man or no timetable that will let him know he is ready. All it takes for him to realize that is the leap of faith and embracing his individuality that allows him to become Spider-Man. 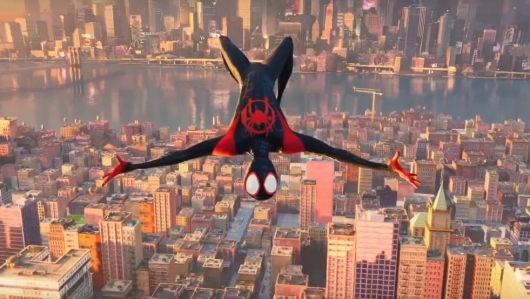 What makes Spider-Man: Into the Spider-Verse so special and unique is not that it puts a new spin on the Spider-Man lore, but that it revolutionizes it and the animation medium in one fell webswing. Visually, it’s a comic book come to life, with each frame looking like a comic book panel that comes off the pages and leaps into action on the screen. Narratively, it stays true to what comic books are, with Miles struggling to form his own identity in a universe that already has an idea of who Spider-Man is. Below is a review of the bonus features, which fans of the film or the animation medium should watch. Spider-Man is more than just one person. He is a symbol of who we could be. And Spider-Man: Into the Spider-Verse explores the many different universes in which a Spider-Man exists. But no one universe is the same, and as such, no one Spider-Man is the same. This feature is meant to celebrate the many permutations of the character and how the name goes far beyond gender and culture. And how the message of “anyone can wear the mask” is reflective of the diversity and the changes in the world that we see now. Animation has come so far since the days of being traditionally hand-drawn. Since then there have been CG films and even a blend between the two. But now, Spider-Man: Into the Spider-Verse experiments with all sorts of new techniques like hand-drawing art over CG, something of which has never been done before. By doing this, it evokes the idea that audiences are looking at a comic book come to life. Additionally, the feature gets into the use of comic panels, as a story device to help control the film’s pacing and rely of information. The use of text on screen also helped with the audience’s engagement of the story and brings them further into that world as if they were living in it. This 15-minute feature takes a look at the cast and what they brought to the recording sessions. In it, we get to see the creative forces explain why they chose the actors for their respective roles. At the same time, we get to see the actors talk about their approach to the characters and how they infused a little bit of themselves into them. Spider-Man: Into the Spider-Verse probably would not have been possible without Stan Lee and Steve Ditko. The two are comic book legends who not only live up to the legend but they are beyond legend. This eight-minute feature pays tribute to the two creative minds that created the globally beloved webslinger who has transcended gender and race. We now see a hero who can come in all sorts of shapes and colors, and one who can look like anyone, and live up to the idea that “anyone can wear the mask. When you have a comic book movie like Spider-Man: Into the Spider-Verse, there’s obviously going to be the obligatory Easter egg inserted into it. Judging by the first few minutes that pay homage to Sam Raimi’s trilogy, to the comic book universes themselves, and of course, Stan Lee and Steve Ditko, you’d be hard-pressed to miss any of them. But for those who don’t freeze every frame, this five-minute feature takes a look at some of the Easter eggs that you may miss. Of course, they won’t show them all, but it encourages you to look out for these Easter eggs after you have enjoyed the film. This feature focuses on the challenges of bringing all of the different heroes that share the name of Spider-Man into one film. It doesn’t get any easier when some of these characters have different designs and unique styles to them. So to see a completely saturated Spider-Ham, a black and white Spider-Man Noir, and an anime Peni Parker all share the same frame is truly a rarity and one that should be appreciated because it only emphasizes how far the artists were willing to push the medium to bring audiences not only the best film possible but one that would live up to the idea that no one has ever seen anything like it. Spider-Man has such a colorful and creative rogues’ gallery, it would be difficult not to put that into use, especially when Spider-Man: Into the Spider-Verse brings in color and creative cast of Spider-heroes. Here, we get to see some of the villains that are in it, some of the quirky touches that give them a distinct look, the inspirations from the various comics, and the new spins on the character’s original designs. Alternate universe mode is a different kind of filmmaker’s commentary. In it, you get to see the film plus an additional 30 minutes of unfinished animated footage that didn’t make it into the film. You get to know more about the scenes you love plus why some didn’t make it from the filmmakers themselves. Can you spit lyrics or sing like Miles Morales? Do you not know all of the lyrics to “Sunflower”? Then these two lyric videos for “Sunflower” by Post Malone and Swae Lee, and “Familia” by Nicki Minaj and Anuel AA (feat. Bantu) are just for you. Tex Avery and Chuck Jones are just some of the memorable cartoon artists from the Golden Age of animation. And for those who love the over-saturated art, and particularly Peter Porker, a.k.a. the Spectacular Spider-Ham, this feature is just for you. See the titular character fight bad guys in a crazy and wacky fighting style and proudly eat hot dogs. That is, until a mysterious portal starts messing with the very fabric of his cartoon reality. Spider-Man: Into the Spider-Verse is available on digital, 4K, Blu-ray, and DVD now.